Evidence of faulting can be seen throughout the Mojave region. Faults range in scale and complexity from small, simple offset measurable in inches or feet to massive thrust faults, normal faults, and strike-slip faults that have displacements ranging upward to tens of miles or more. The timing and rate of displacement along faults is highly variable. Many regional fault show evidence of activity that extend back into Precambrian, Paleozoic, and Mesozoic time. 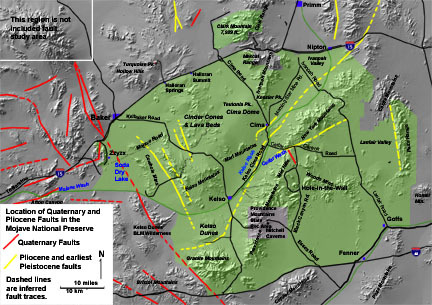 Faulting in early to middle Tertiary Period is largely responsible for the mountainous relief in the Mojave Region, although faulting activity in the late Tertiary through to the present is actively influencing landscape development. Some faults formed in association with volcanic activity. As the Landers earthquake of 28 June 1992 (magnitude 7.3) demonstrates, the region is seismically and tectonically active. 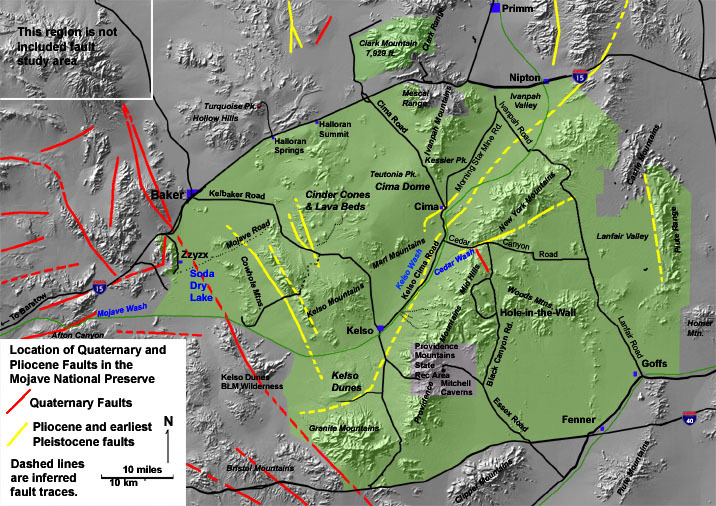 The epicenter of the Landers earthquake was about 50 miles east of the Mojave National Preserve. The earthquake presented a surface rupture over 40 miles long (75 km). This map of the Mojave National Preserve region shows the location of known and inferred faults with activity ranging that display either late Quaternary displacement activity (in the past 600,000 years - shown in red), or faults that show slightly older activity (roughly 600,000 to about 3 million years - shown in yellow). Older faults, which are abundant, are not shown. For a larger verion of this map, click here. Fault movement influences the landscape by uplifting barriers to stream or wind flow, which in turn influences the patterns of sediment movement and deposition. Fault activity influences the geometry of mountain fronts and the development of basins. Faults activity during the Quaternary influenced the location and development of lakes (and playas during the dry periods), and influenced the location of dune field development. Faults also serve as pathways of fluid migration. Desert springs are typically associated with fracture in rocks. Also, many mineral resource prospects in the region are related to the implacement of magmatic fluids or ore-mineral precipitates along fault and/or fracture zones. This view is looking west into the Badlands of eastern Lanfair Valley. A stream has carved a valley into Piocene and Quaternary basin-fill deposits. In the distance the stream leaves the sedimentary basin fill and enters a canyon carved into middle tertiary basalt flows of the Piute Range. A major north-to-south trending fault defines the western side of the Piute Range at this location. It is likely that canyon is actively forming as the Piute Range is gradually rising along this fault zone. The red basin-fill deposits do not contain volcanic material derived from the adjacent volcanic rocks. This suggests that this fault system is relatively young and may be still actively developing.